TacomaTurf: The Range is Toast ! The Range is Toast ! SPRINKLERS WILL BE RUNNING ON THE RANGE TEE FROM 2:30pm to 3:00pm EACH DAY THAT WE HAVE DAYTIME TEMPERATURES ABOVE 85! THE RANGE TEE WILL NOT BE CLOSED BUT IF YOU CHOOSE TO HIT BALLS DURING THAT PERIOD, IT'S POSSIBLE THAT YOU WILL GET WET. IF YOU WOULD LIKE TO KNOW WHY THIS IS HAPPENING, THEN KEEP READING. This is what the range tee looks like today. Needless to say there is very little grass and the surface is very sandy. We struggle with the range tee every summer but this is definitely the worst it's ever been. This summer we have had more dry, hot days than has ever been recorded during any summer in our history. That means there has been more use of the range tee and also more difficult growing conditions. Warm weather is great for germinating seed and growing grass but in order to do those things well, you need water. Watering the range tee only in the morning or at night is not adequate when every day is warmer than average. Water needs to be applied mid day to minimize loss of existing grass and facilitate seed germination. This is why we will be running sprinklers on the range tee during the day while we are experiencing this heat wave. The daytime watering will definately help with the condition of the tee but like I said earlier, we always struggle with the range tee so there more to it than just water. Here's a little history lesson to help understand our situation. Above you see how the range tee was after it's construction in 1989. We had two decks which provided a total of 30,000 square feet of hitting area. That was adequate back in those days when everyone paid for each bucket of balls. Golfers back then were satisfied with hitting a bucket of balls or just a few to warm up before their round. That started to change in the early 90's. A new generation of golfer was forming. Golfers wanted to spend more time practicing. In 1993, the Club changed to a range program where you payed a monthly fee and had unlimited use of the range. Right away there was a problem with adequate space for this type of program. The solution was creative and economical. 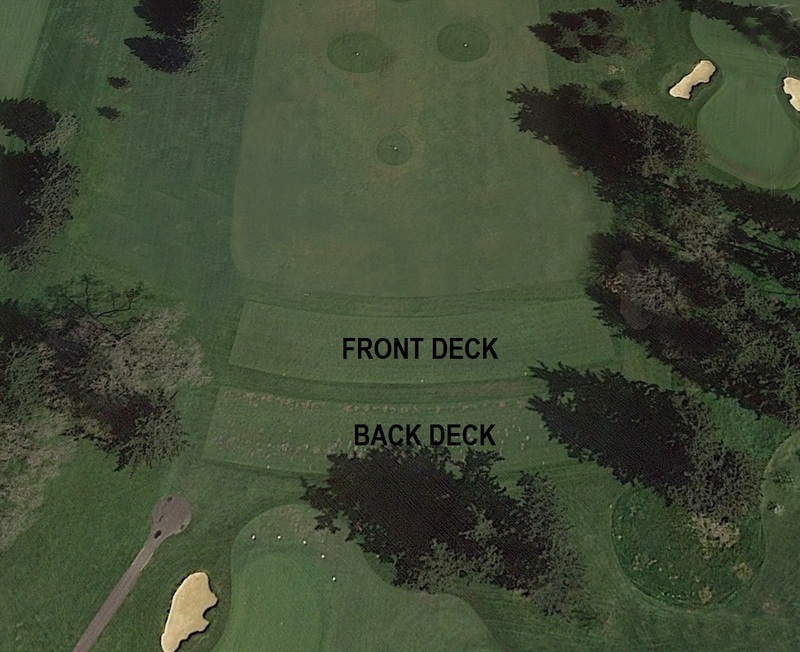 The part of the range closest to the forward tee was simply mowed in such a way that it became a hitting area. The image above shows the new configuration. Now there was 45,000 square feet of hitting area which is what we have today. So now you know why that front deck is not level and so uneven. It's because it was never constructed as a deck and never intended to be a hitting area. So anyway the added hitting area has made the range satisfactory most of the time. 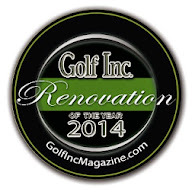 But times have continued to change and now the membership is made up almost entirely of the new generation of golfer. Our membership loves to practice and in fact many members are members because of the practice range. So we have simply out grown the range tee once again and there is a need to increase the size of our hitting area. That is something the Committee is exploring at this time. In addition to more space, a new range tee would have a state of the art irrigation system with better control so that you can hit balls while we irrigate and not get wet. In the mean time, please bare with us as we try and make our existing range tee work for you.